The pair are on the run in Kingston. Beyoncé and JAY-Z are up to something in Jamaica. The couple were seen in Kingston on Tuesday filming alongside director Melina Matsoukas. 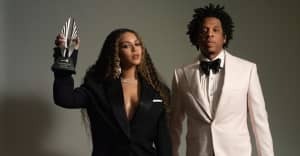 There are no confirmed details as to what they are filming for, though visuals for the upcoming On The Run II world tour would seem like a good guess. Who knows though? Fingers crossed for another visual album. The duo were pictured riding a motorbike similar to that from the OTRII tour poster inspired by 1973 Senegalese movie Touki Bouki. Blue Ivy was not spotted with her parents. Perhaps she's back home planning which auction to hit up next. The FADER has reached out for further information. Check out all the evidence the Beyhive has collected on their queen's trip to Jamaica.